Hello everyone: I have a super easy card to share with you today, that I will link to a few challenges at the end of this post, Valentine's Day is fast approaching and I needed a couple of cards for my youngest grandchildren, this is one of them. I love the images on this retired SU set called "Pun Fun", I haven't used it in a while, so thanks to the challenges I'm entering, I dusted it up and grabbed this stinking cute little skunk to make my card. Easy peasy.....stamped it on a panel of water color paper with Versafine black ink and clear heat embossed it then, colored with SU markers and the aqua painter. The pattern papers are from a sadly discontinued line from Lili of the Valley, the hearts were punched with the ever so fabulous Owl Builder punch from SU. 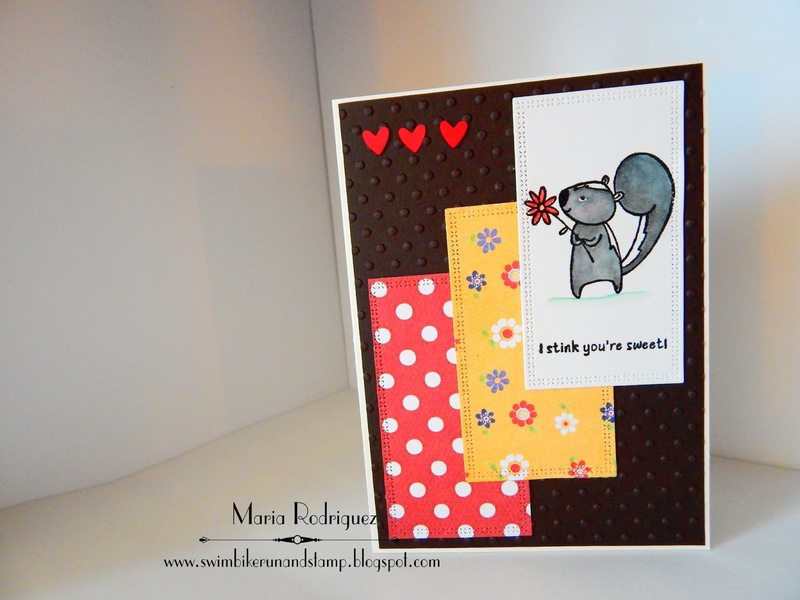 I embossed the dark brown panel with a dot embossing folder, hope you can see it. The sentiments are from a retired Flourishes set called "From the Heart". 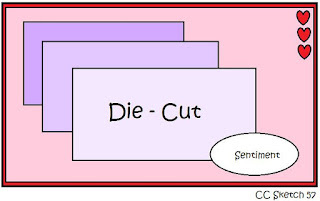 Die Cut Divas Sketch challenge #303. Cards Und More challenge #177, Pets and other furry friends. Mod Squad Challenge Blog "Let me see you TEXT(urize)", I dry and heat embossed my card. Paper Craft Crew Challenges Theme Challenge #230 "LOVE"
Simon Says Stamp Wednesday Challenge "Simon Says Cute". Hello everyone and welcome to another challenge over at SHOPPING OUR STASH, where we want you to go ahead and go "shopping" for all of those old stamp sets, embellishments, papers you know you have in your stash somewhere in your craft room. I did just that with this card, the stamp and corner punch have been on my neglected stash for a very long time, unused and forgotten. Well, no more!!! 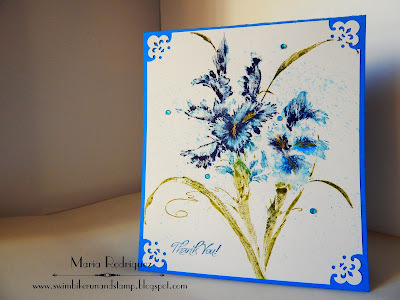 this was a perfect opportunity to create a card using this gorgeous stamp from Penny Black Slapstick called "Passionate", here is my card. I love Iris flowers, their delicate petals are almost transparent, they come in all kinds of amazing colors, so the sky is the limit as to which one to use. I got this stamp a long time ago, I think I've used it only once and I'm very happy to play with it again this time for our challenge. The stamp it'self is big so I had to create a card base specially for it. Then, I stamped the image using the technique on THIS FABULOUS VIDEO by Virginia Lou. When I saw it, I immediately went and bought this stamp, it's incredible how easy it is to do it like Virginia, the water colored look is truly fabulous. The corners of this card were punched with a super old punch from The Paper Studio, I think this particular design is retired because I couldn't find it to share the information with you. This sentiment is from my Flourishes stash of sentiment stamps and so is the little basket of flowers. 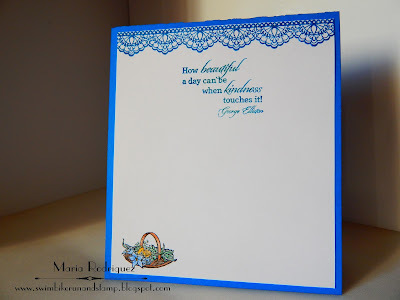 The beautiful border is from Stampin' Up! and it's called "Delicate Details", from the Sale-a-bration catalog. I hope you feel inspired to make a card that has NO Winter theme, using the color BLUE and join us in the SHOPPING OUR STASH gallery and, for more inspiration, hop over to my teammates blogs to see their beautiful creations.